To Sum It Up: Juliette, Adam, and Kenji are safe for the moment at Omega Point, the hidden base of a resistance movement against The Reestablishment. Juliette is among others who, like her, possess a gift. Being at Omega Point—and out of Warner’s reach—isn’t without its challenges, however. Juliette struggles with her training to control her power, and she’s also troubled by the growing distance between her and Adam. Warner is still out there somewhere, too, searching for Juliette because, even though she put a bullet in him, he’s more determined than ever to have her by his side. Review: Is it okay to give five stars to a book in which: the story starts rather slowly; the heroine frustrates you at times with her self-pitying whining; one-third of the love triangle has a fairly low profile this time around; and you inexplicably love the other, utterly deranged third of the triangle, and you know you should know better but you can’t help yourself and you’re pretty much basing the entire book’s rating on your love for him though it completely defies sound judgment and maybe your reviewing principles? I’m going to say yes. Yes, it is. What a steaming bowl of insanity Unravel Me was! That is, once its momentum got going. I thought the first few chapters, which oriented you to Juliette’s new life at Omega Point, were kind of slow-moving. The pacing at the beginning wasn’t helped by Juliette’s moping, either. I’d expected her to be, I don’t know, at least a tad upbeat about escaping with Adam and discovering that there were other people who possessed special gifts. But no. Juliette is gloomy because she can’t yet wield her power at will, and she’s also gloomy because Adam is so gloomy for reasons he won’t share with her. If it hadn’t been for Kenji calling these two out for their angst fest and exhorting them to snap out of it, I wouldn’t have been able to tolerate them as much as I did. I love Kenji; he’s hilarious and to the point. I was surprised to see Adam with a diminished role here. I mean, he’s there, but considering how he’s supposed to be a love interest and all, his presence is rather muted and is even eclipsed by Kenji’s. My feelings for Adam have always been neutral—I neither love him nor hate him—but aside from his part in a bombshell revelation, he’s not given much to do in Unravel Me. I’m going to attempt to keep the requisite Warner paragraph from turning into an essay on how much I love him, but if you’ve read my reviews of Shatter Me and Destroy Me, you know that may not be possible. I didn’t think Warner could dominate the series any more than he already does, but once again, he’s pulled off the unexpected. Warner completely messed with my head in Unravel Me. Completely. And I loved it. I have abandoned all efforts to figure this guy out. When he told Juliette that he loved her in Shatter Me, I thought he was just raving like a madman. After reading Destroy Me and Unravel Me, though, I believe him. He truly feels that Juliette is the only person in the world who could ever understand him. As much as the novel may be about Juliette joining the resistance as it prepares to take on The Reestablishment, it’s also about finding out that there are many layers to Warner’s character. I’m not sure that he lets all of his walls down here because I think he’s too cunning for that, but he certainly allows Juliette to see him a lot less guarded than he usually is. And that right there is why I loved this book. I wasn’t at all prepared for the plot twists in Unravel Me; they were so shocking that I needed some time to process each one. They also more than made up for the quiet opening that had me wondering if this was going to be as amazing as Shatter Me was. 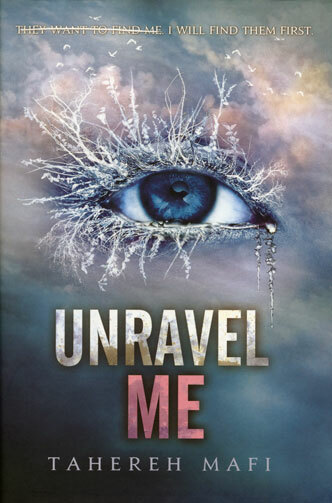 My concern was totally unfounded because Unravel Me was a head-spinning sequel that went in every direction except the one I thought it would go toward. My imagination is way too limited to make any predictions for the final book. As long as Warner is okay, I’ll be happy. All in All: No second book disappointment here, especially on the Warner front. I know I’ve let him sway my opinion of this series, but I can’t help it. Besides, he’s not the type of character you can ignore, whether you want to give him your heart or punch him in the face. One thing you never feel for Warner is indifference. It seemed like Juliette took a few steps back at the beginning character-wise. I thought she'd be somewhat happy being among other gifted individuals instead of pouting over not being able to smash bricks whenever she wanted. But Warner being . . . Warner was more than enough to carry the book for me. Nightshade is on my TBR list; hoping to read the first book soon, and I'm very curious about Ren now! I was very frustrated at the beginning of Unravel Me as well. I kept asking myself when Warner would make an appearance. After he did things started looking up :) Not to mention Kenji being his awesome self and telling Juliette out. I actually could understand where she was coming from, but it was still quite the slow start. Haha- I kept wondering when Warner was going to show up, too! At least Kenji kept things entertaining, not just in the beginning, but throughout the book. Love him! I'm not big on love triangles, either. Most of them make me roll my eyes because you know which guy is going to get chosen in the end. haha, I'm like you. I gave Unravel Me 5 stars as well b/c of Warner. W/o him, I would have given it a 4 or 4.5. I would have classified it as a good sequel but not as good as book 1 w/o him. With him, though, I would definitely say that it lived up to book 1. haha I also agree with you completely in that Warner is so hard to figure out! I was like "Oh, he's good. He's good." And then, bam! the reader finds out that he told everything to his father. It's a lot more complex than that, but I really like the complexity. I cannot wait to learn more about him in the final book! I absolutely LOVE how unpredictable Warner is, even when he's being the villain. I cut him a ridiculous amount of slack when it comes to his faults. I probably wouldn't be this generous with another character, but Warner somehow pulls off switching back and forth between bad guy and good guy effortlessly. I felt a tad guilty bumping Unravel Me up to 5 stars just because of Warner when it was really more like a 4.5, but he really did bring out the best in the book for me.